We have 2 trees up in our home. Our living room houses our ‘big’ tree, where all of the beautiful ornaments we’ve collected over the years and some new ones are prominently displayed. In our dining room, we have a smaller tree that shows off my favorite ornaments, those that the kids have made at school or church, or on crafting adventures with me. 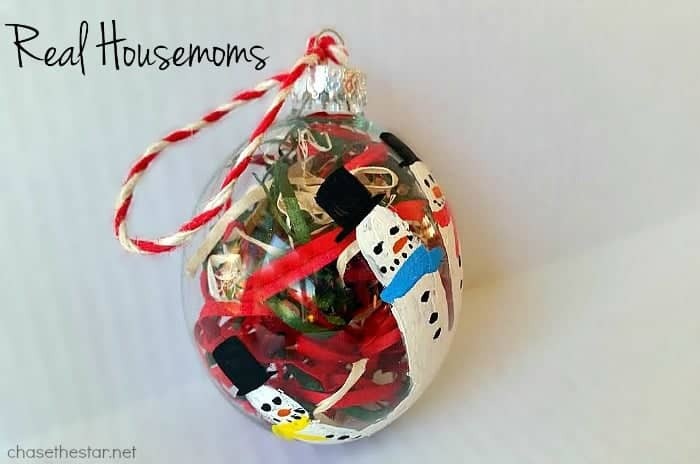 Handmade ornaments are my absolute most treasured Christmas decorations! Each one tells its own story, and can become a special family keepsake that can last forever. I craft with the kids often, mostly with my youngest, since he can still appreciate it! He loves to get creative and I love to spend time with him. 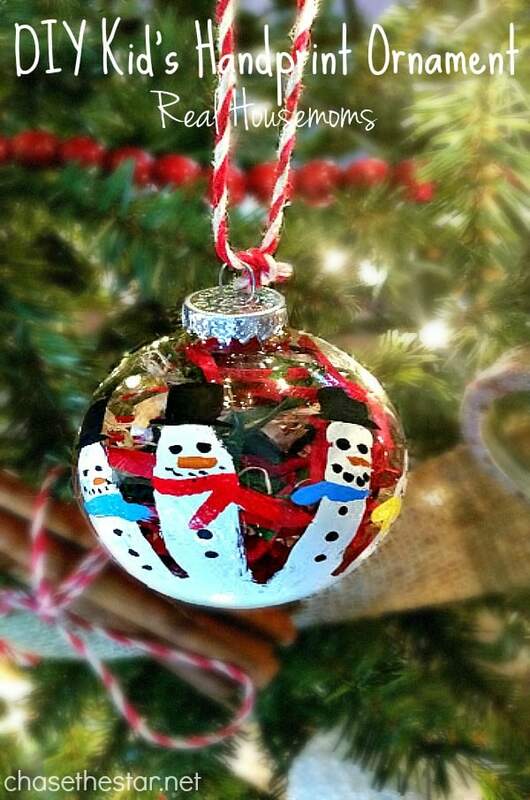 We just made a cute Snowman Ornament using his little handprint, the perfect memory for this year and years to come. 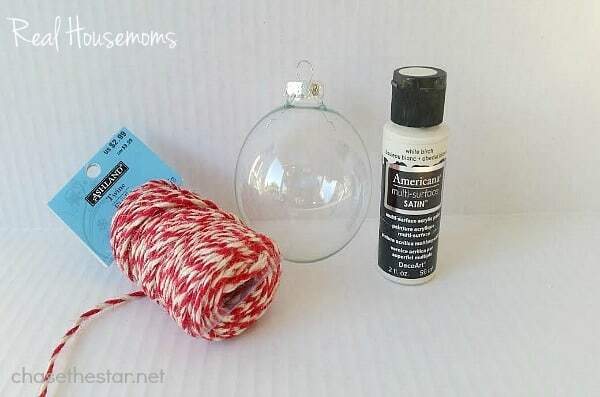 Using glass ornaments (plastic work well too), acrylic paint, and colorful twine, we put this ornament together in no time. I poured some white paint onto a paper plate and gently pressed his hand in it, then placed it onto the ornament–being very careful not to let him touch anything else! This left his handprint on the ornament, giving us enough ‘snowmen’ to represent our family of 5. After letting it dry for a while, we used more acrylic paint in various colors to bring the snowmen to life. Then my little guy stuffed some holiday excelsior into the ornament, and we put the lid back on. These are easy enough to make one with each child in the family. We had a great time making our Handprint Ornament! It’s hung on the tree in our dining room, and will be every year to remind of us of how little his hand once was. Maybe he’ll want to take it with him when he has his own family, and perhaps even start his own tradition! What holiday traditions have you established with your kids? This is such a cute idea!! I have to do this this year with the kids for our Christmas party. 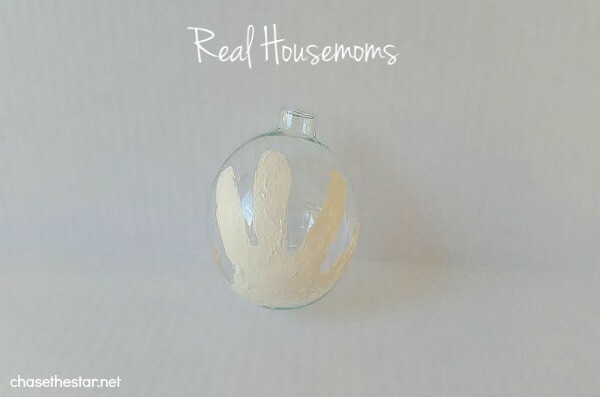 We love making ornaments like this, your really appreciate them over time. What a cute idea. I need to do this my girls, I just love handprints to remind us how small our children were. What a cute ornament! 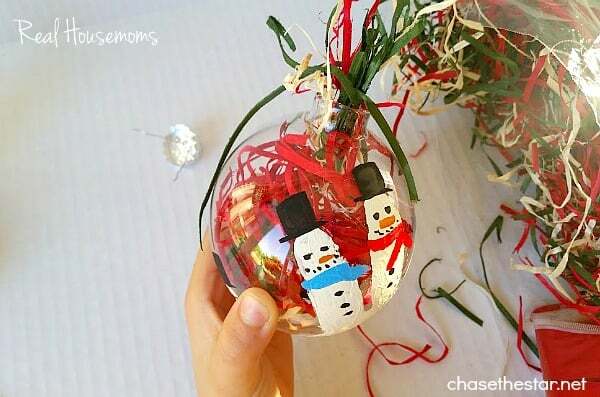 It would be fun to make these with my kids.